Our family will be happy to welcome your family to our dental office in Elkridge, MD. 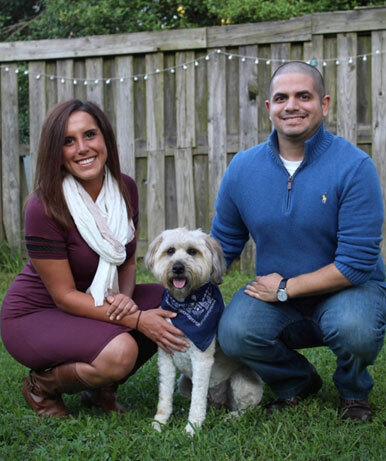 On the photo, pictured from right-to-left is Dr. Arian Hamidi with his girlfriend and Mint Dental Care office manager, Leila, and centered is Mint Dental Care mascot, Harper. Come to our office to say hello! Dr. Hamidi is gentle and patient, providing the best standard of care imaginable. Our expertise and advanced dental technology will ensure that your treatment is performed efficiently and in the most comfortable way. Our staff makes sure that our patients are well taken care of. For the comfort of our patients, we provide blankets and pillows, as well as soothing warm towelettes. At Mint Dental Care, we understand that going to the dentist can be a stressful experience, so our goal is to provide as much relaxation as possible for our patients. Call (443) 917-MINT (6468) to schedule an appointment today!